Posted by mareserinitatis in younger son. I picked up the younger boy from daycare after work. The plan was to run two errands and then pick up pizza on the way home. However, we were delayed at our first stop. 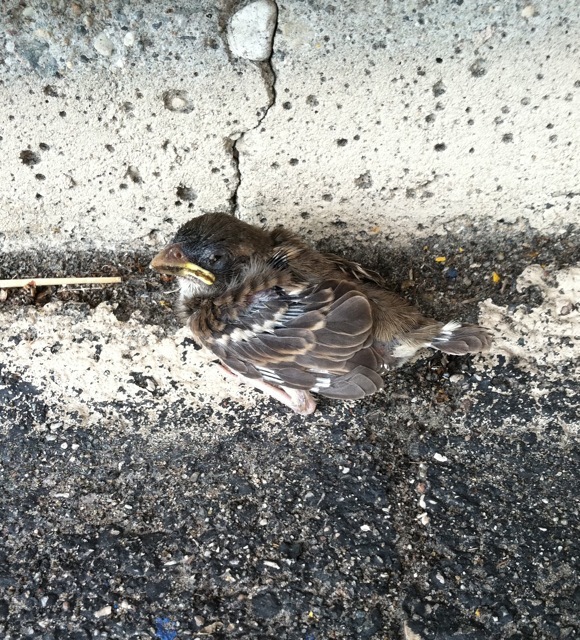 At the grocery store three block from our house, the younger son noted a baby bird in the parking lot. We followed it around for a bit, and realized that 1) he couldn’t fly well enough to get back to his nest, 2) Mama was doing her best to keep the crows away from him and keep him fed, and 3) he had this horrible tendency to hop into traffic unless we were standing close by. The younger boy kept an eye on him while I went inside and bought a couple of tin cooking pans. I thought that we could at least put him in one and let mama keep feeding him. At least that way he’d stay out of traffic. No go. He didn’t like the pan and was able to hop out in short order. I tried calling the local zoo, who said I should call the Game and Fish Dept. They, of course, were closed until next Monday. I called a friend who is has a vet tech degree (and dealt with more exotic species). No luck. In the meantime, I pointed out to younger son that when Mama was getting close to the baby, he’d start chirping and she’d come over to feed him. The younger boy, of course, felt we must bring him home and love him and cuddle him and give him a bath…then asked how to bathe a bird. I kept telling him that Mama was still taking care of him, and if we brought him home, he would very likely die. I called Mike and we talked about it, and I suggested bringing him home and getting a ‘nest’ set up…then I could bring him back after dark when there was no traffic. Mike had a better idea: he found a shoebox, put a brick in it (to keep it from blowing away in a strong wind), and filled it with grass and weeds. Since we were only three block away, he ran it over, and we got baby bird into it. Mama found him a couple minutes later and started bringing food over to him. Also, she started keeping an eye out for crows. We left to get dinner (because it was well past the time we were supposed to have been home and had dinner). On our way back home, we checked back in on the impromptu nest. Baby bird was happily snuggled between the brick and the side of the box, almost completely hidden in the grass. It opened one eye when we came up to the box, but quickly closed it and fell back asleep. I think the younger son was disappointed that he didn’t get a new pet bird, but I think he understands that this is his best chance for making it. The younger son said the only thing better would be to find a large grassland, devoid of any other animals. He could be right.